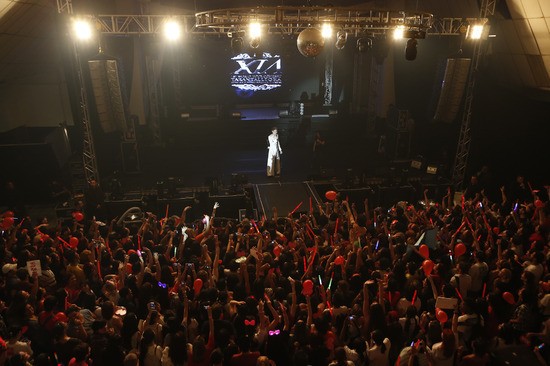 JYJ‘s Kim Junsu (XIA) put on a superb performance in front of 5,000 fans this past week. The singer who wrapped up successful shows in New York and Los Angeles continued his World Tour by performing at the Blackberry Auditorium in Mexico on September 6th (KST). The fans there enthusiastically responded to his visit by perfectly singing along to his songs “TARANTALLEGRA“, “UNCOMMITTED“, “I Don’t Like Love“, “Set Me Free“, and more. 3,500 fans flocked to this performance in Mexico, and the local media outlets as well as the cultural center were shocked to see that the show had completely sold out. This entry was posted in Achievements, ALBUM, Concert, INFO, JYJ-Pop, K-Pop, Kim Junsu, Momma's Boys, Momma's Music Favorites, News, Singing, Songwriting, Xia's Art and tagged 1st World Tour, Brazil, info, Junsu, JYJ, Mexico, news, osen, Xia by chaelwest. Bookmark the permalink.